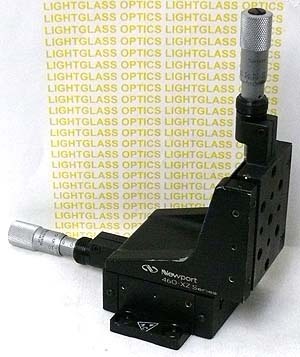 This Newport 460-XZ High-Performance, Integrated, Ball-Bearing Linear Stage is the predecessor of the 460A series and is nearly identical in appearance, and is identical in dimension. The 460-XZ is a two-axis stage, offering 0.500 of travel in the X and the Z axes. Made of Aluminum for light weight, the movements of this stage have precision ball-bearings riding on precision-ground and hardened rods. This offers a nice compromise of precise travel at an economical price. The Newport micrometer actuators shown are included in the price.